Passed Away? – What of Crock of Crap !!!! – They were Murdered! …. SHhhh …. Hear this, the only spirits in this world or other, that are going to be disturbed, if any are, are those who are responsible for sickness or sympathetic for such and have the Truth shined “at” their Sorry Arse …. Compassion is a two way street, given to those who give, Dennis Banks and the crew, only pretend to give when there is something in it for themselves. If that is so, Dennis Banks and friends should be tried for War Crimes. it is mind boggling how demented some people’s beliefs have become, while they continue to protect assailants and pretend to be advocates for Missing and Murdered Women. A few interesting notes on “that is in the past” , and “that is political” and “Let them Rest” …. Deleted by the Bemidji Pioneer of course! Joe Wade > “as well as a GoFundMe page” , why should someone step back into the light when people are throwing money at them ???? Joe Wade > and the Media palys into such crazyness , LOL! 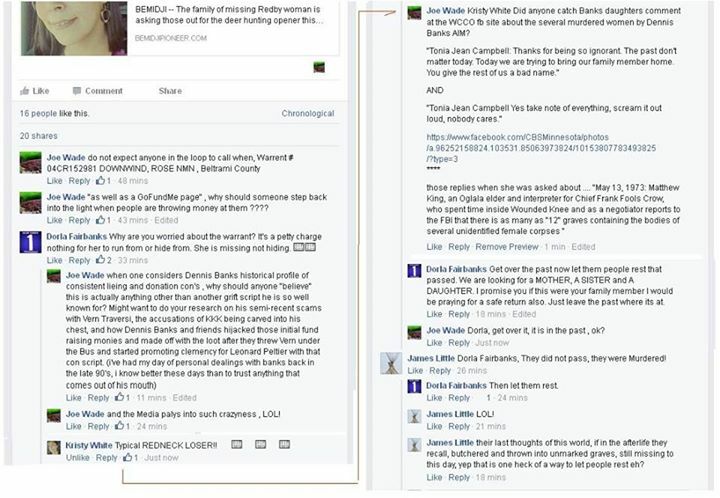 Joe Wade > Kristy White Did anyone catch Banks daughters comment at the WCCO fb site about the several murdered women by Dennis Banks AIM? Grandpa Dennis holding out on support AGAIN eh? Interesting the 10,000 goal fund raiser page for the Missing Woman, was started off for a Reward Offer (same time Dog the Bounty gave 10k as a reward) , then the Bemidji Pioneer reported it changed to a fund raiser for Operating Expenses, and now the Pioneer is reporting “GoFundMe has also been established to help with expenses for the Missing Woman’s five children. AND yet with all the negative publications about abuse from the ex-boyfriend and finger pointing at the persons of interest by the Bemdiji Pioneer, not once has there been any reports of Downwind, except how loving a mother she is. There is MORE to this Dennis Banks of AIM prompted issue than what meets the eye! Anyone Need to say flight from a Child Custody Issue here? Amazing how the Bemidji Pioneer will use it’s public service of so called journalism to enable these clowns to advertise fundraisers on the plight of a missing woman, it will be interesting to see the future dog and pony show by such a working team while they try to reap financial gains whether the Missing Woman is deceased or not. Three weeks now, fund raising and preparing for searches while hanging out at the NL Casino Bar with Hotel stays, when the search area is 60 miles away. At the rate DWA Weston (Beth Timmins the spokes person for the Missing Woman Search Team) and crew is going, expect fund raisers for children Christmas gifts and spring concert fund raisers by DWA’s weekend band. Those who thoroughly understand Dennis Banks and his grifter cons, none of that would be unexpected, considering Dennis Banks life history of people disappearing from his actions would it be surprising or unexpected for involvement of Banks if the Missing Woman ends up deceased. Dennis, his family and team members for years has called Denise Pictou Maloney (& family of Annie Mae OR any other people seeking justice for missing or murdered family by the hands of Dennis Banks & AIM) FBI informant while she pursued justice for her Mother. The intent, to black jacket her just like Dennis, Peltier, Clyde, Russel and friends did that led up to AIM leadership ordering her Mother’s Execution, that Murder carried out by AIM members. DWA Weston (Beth Timmins the spokes person for the Missing Woman Search Team) and friends doing the same, OR Wearing Annie Mae like a shoulder patch saying she died for “their cause”, upto this day while she and friends stand in support of the AIM members convicted for murder. Am very much aware of “their” Black Jacket Labeling Script from personal experiences, I elected with Honors not to accept a Diploma from Leech Lake Tribal College because those teachings and promotions became part of the schools cultural fabric. 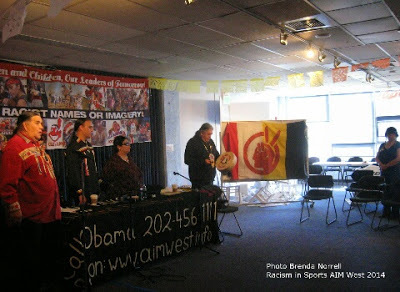 Shortly there after Ginny Carney (a rightful last name for a self declared Cherokee) became president, And Dennis Banks became a Board of Trusties Member…. 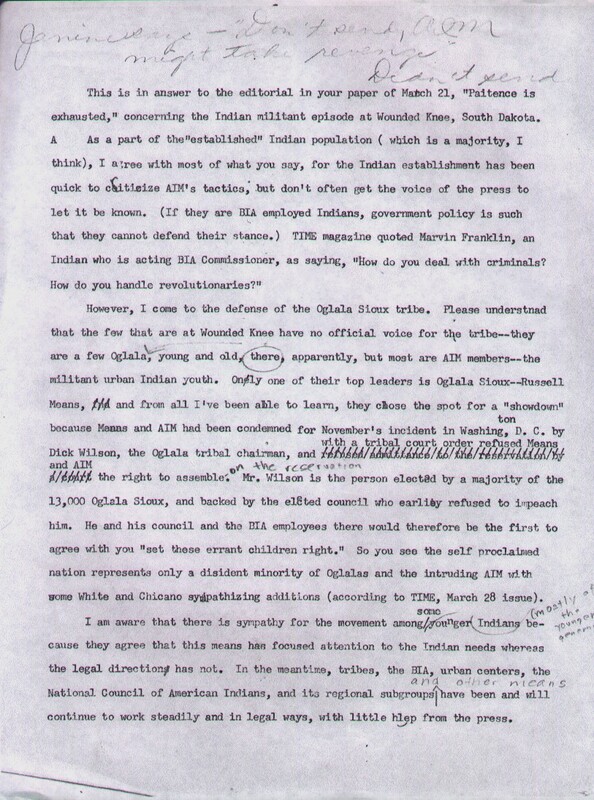 Shortly thereafter anyone who opposed the teaching of Dennis Banks was pushed out of the door by Carney and Flemming …. Go Figure eh? Missing People Advocates – Just Great eh? This Missing Person Campaign has Spiritual Abuse and Violence written all over it, to garnish more financial support to spread more through the assistance of the News Media. 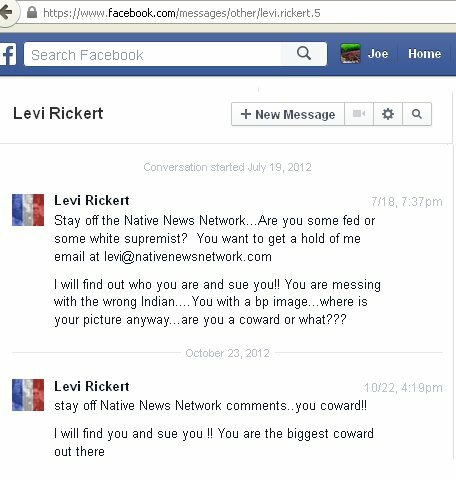 2012 – A Special Note to me from Native News Online. Publisher levy rickert gets a bit upset when people confront him with Truth & debunks his journalism of myths and deception. eh? Oct. 27 – NativeNewsOnline 1st article about missing. 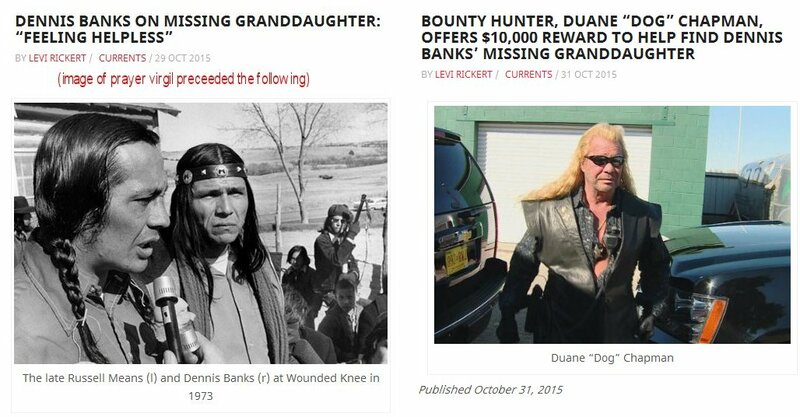 Oct. 29 – Dog Bounty offers 10k reward, and announces he will come to MN. Nov. 12 – DWA Weston (Beth Timmins) – Family spokesperson publishes her 1st promotion for her weekend band. (turns 1st formal search into a Phoenix Rises Event) – occurs 1 day after this blog entry. **** over a week missing before being reported, finger pointing of abuse by ex-boyfriend starts by Banks and by media towards persons of interest who are are also reported as being very abusive, fundraisers changed from reward to operating cost needs, to need of children, constant media coverage about how loving the mother is without any reporting at all about her criminal record convictions of violent and abusive behavior, 1 month of NL Casino gathering at the bar and hotel stays by search team organizers, 1month passes before 1st formal search by missing persons search team …. Just Saying …. What i find most disturbing is people utilizing the plight of missing women along with the media using the plight of a missing woman to serve “their own needs”. A few updates about the search team, in ref to Dog, every indication shows he has disassociated himself with this missing person issue all together, he announced he would not be coming to MN. to participate in the searches, not a fb follow up on this missing person concern since the 6th, nor on Beth his wife’s fb page which last entry was also on the 6th (whereas both had a pretty good run of posting that coincided with NativeNewsOnline and the local Bemidji Pioneer Newspaper. Initially numerous news media picked up and ran with the story of Dog and Banks, thou since dog’s release he would not be coming to MN the publications carrying and updating “the missing person has dwindled to practically nill. It is obvious Dog had an open ear to the potential avenues for he and his wife and their show being used and abused. AIM inc. Clyde pooped his head into the NL Casino last week, thou from what the local talk is from tribal members sitting back watching, he was not well received at the bar search meetings. Contacted Bemidji Pioneer Newspaper and made the editor aware of Clyde’s presence in the neighborhood and put in a request to do an interview with him in an upcoming release since that news group was so consistent with promoting Dennis Banks & AIM as a side note in the missing person concerns. I agree 100% this is not an issue of Banks, AIM, etc …. Thou i do keep in focus, Dennis, his buddy Levi Rickertt (NativeNewsOnline) and the local Bemidji Pioneer NewsPaper consistently pushed such foolishness onto the missing person concern with attempts, for that AIM limelight focus, to migrate across the news media realm AND the backlash for doing so resulted in crash and burn to the attempts to exploit a missing person for “their own” personal gain. When will t-shirts, buttons and posters arrive? 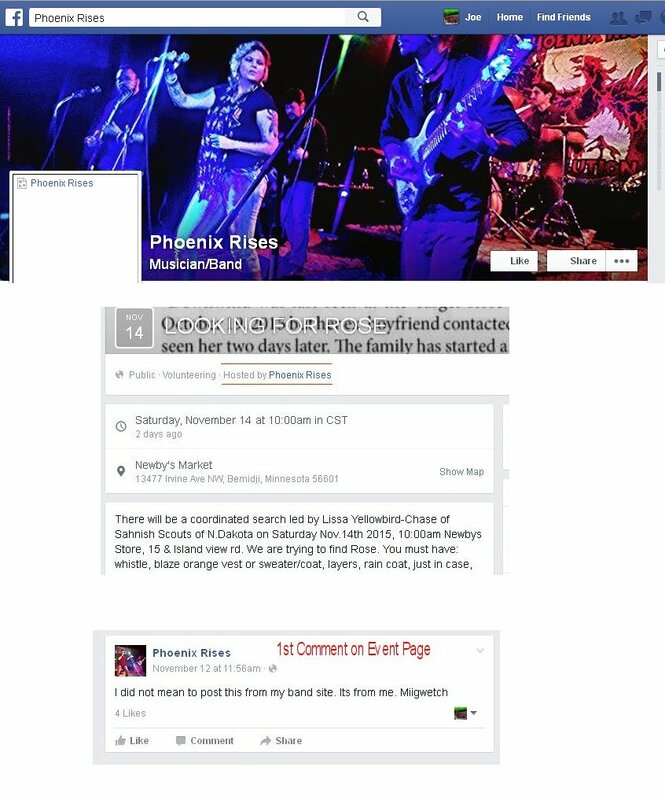 Considering almost a week passed before Dennis Banks created the Media promotions while pointing his finger at a so called abusive boyfriend, I still wonder if this is actually a Missing Person at all AND if not, family member or not, this woman will be deceased by the time Dennis if finished with her, if he needs to protect his own arse. That is Nature and historical profile of Banks and AIM Poison! GET READY FOR THE NEXT PHASE OF THE BPIONEER ASSISTED AIM SCRIPT ! TO BE ACCUSED OF RACISM ! by these Poser Advocates of Native Lives Matter, who in reality are nothing more than militant urban indians ! Bemidji Pioneer take a HINT! As per the comments recieved from both Dennis and Matt through person to person discussions and phone conversations. On censorship of public fb replies; paraphrased: “We decide what is acceptable for the image of our media outlet”, “we want to create stronger relationship with the tribes” AND banning public from the Bemidji Pioneer fb site: “We decide what is best for everyone” …. Letter from a woman who today is 80+ and still lives IN FEAR, as per the hand written note at the top of her editorial (which was never sent) because of Her Fear of AIM, that FEAR she carries to this day along with so many other people. AND NOTE HER WORDS, that applies to YOU. From her archives saved away for over 40yrs in a piano bench, that were posted to the net as per her request. the News Media Creating more Avenue’s for AIM Rants of RACIST WHITE PEOPLE !!!! Typical AIM indoctrination from Wishelle Banks eh? 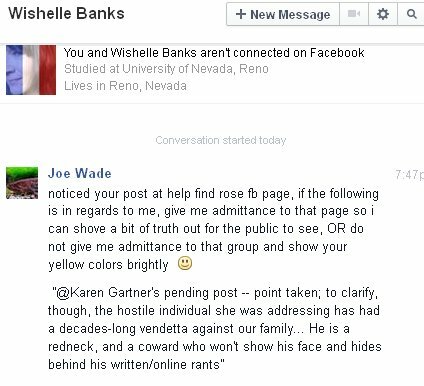 He is a redneck, and a coward who won’t show his face and hides behind his written/online rants — and, frankly, a nutjob who is taking time to harass Rose’s family… that won’t be tolerated! What IS earnestly appreciated, though — without name-calling — is anyone and everyone with A GOOD HEART, who puts aside personal viewpoints, and offers to help. To all who’ve donated water, food, supplies and their time, no one here is calling them names. Another team member of those who support the convicted murderers of Native Women, and the murderers of other innocents buried away to this day in hidden graves, while “they” pretend to be advocates for Missing Women. New Person of Interest for Missing Woman – MOI ! Dennis Banks daughter and search team’s private messages have caught the ear of a little blue bird who directed me towards “their” Help Find Rose Downwind fb post …. Of course the daughter and clowns who talk in private as such are unable to say “Who” they are speaking of in public. That request for understanding of “Who” in a public realm was deleted! Have to say without hesitation, there is not a person i have ever met, who is sympathetic towards Dennis Banks and AIM, that is not a carbon copy of underhanded characteristics of trying to black jacket people. Followed up with a inbox message from one of the team members Kip Tassin Monoessy , as per her fb page is, President at American Indian Movement Oklahoma sg, Owner at EEC Planning, LLC; Event, Entertainment, Conference and Event Planner at The Professional Pow Wow Association. Such Great Advocates for Missing Women eh? Link to fb dialog DWA was refering to as Hate messages, as she tries to use the help find missing woman’s fb site as a tool to black jacket people. how many fundraisers are actually out there? how many fundraiser will there be? Care to guess why the world views and identity for too many of the youth is all screwed up? Media is reporting argument over cell phone msg. that woman said she was going to be reported to the law to show the guy had broken court orders of contact. Here we have 2 people with domestic violence convictions, the woman hops in the car and goes to the guy’s home, she ends up at the foot of the stairs bleeding and with no pulse according to the guy , as a result of the struggle over the cell phone. The Media has never mentioned anything about the ongoing domestic convictions, and consistently portrayed the guy as a thug wife beater. ANYONE CARE TO GUESS, where the teachings that shaped the world views and ideologies came from, those teachings that shaped the character and behavior that resulted in the choices and actions leading to the children having such cork screwed parents? James Little The way the media has handled this issue has resulted in the responses seen here. The guys are already convicted without people knowing any of the specifics for reason to arrest and charge. Keeping in mind Downwind had two somewhat recent convictions for domestic violence this could still be a self defense killing but that would not justify hiding the body. Is anything less expected from today’s so called professional journalism? James Little the media has done a great job with sensationalizing this issue, the Bemidji Police has also to a lesser degree done the same within it’s title’s of press releases and not reporting all the facts of public information, next it will be the D.A turn to stand in the spotlight. All in the name of strengthen relationships between native – non-native community for support of mutual agreements of understanding. In short a lot of media hype of a abusive native man throwing him under the bus, while using the plight of a native woman (who’s past history of violence has never been mentioned by any) as a card in the deck for concern. It will be interesting to see how the courts and prosecuter’s will give the same dance in the upcoming trials. This entry was posted on November 11, 2015 at 11:01 am and is filed under Uncategorized. You can follow any responses to this entry through the RSS 2.0 feed. You can leave a response, or trackback from your own site. Got your back on this, niijii! In it’s sick core it comes down to $$$ for these assholes! yep, you are one of the few i know of in this area that can see through the mountains and mountains of b.s, and continue stand with justice and truth , in place of being a pawn of those with pretense compassion , merci for all you do Wade …. Thinking about you & all the good work you’re doing…got a message from BB yesterday, you probably already know but if not, John Trudell is dying or already dead, Creator’s cleaning house. Take care, always in our thoughts & prayers. Keep up the great work, btw: I’m back…..